Entity Data’s Multi-factor authentication solution is powered by RSA SecurID® Suite, providing strong access management, identity governance, and user lifecycle solutions to strengthen security and ensure compliance for hosted businesses. RSA SecurID® Suite ensures you have convenient, secure access—from any device, anywhere—to your Entity Data hosted systems and applications. RSA SecurID® Suite is an enterprise-grade multi-factor authentication and access management solution that provides secure access and seamless authentication. RSA SecurID® Multi-factor authentication solution works in conjunction with other remote access technologies such as Remote Desktop Protocol (RDP), SSH, and our Citrix® SSL-VPN to provide extremely strong authentication to your hosted infrastructure. A variety of both hardware and software tokens are available to fit any remote access requirement. Software tokens are an ideal and highly recommend solution for security in the cloud. Soft tokens are self-registered, automatically seeded, never expire and support optional fingerprint verification instead of a traditional PIN. Soft tokens can be issued immediately and the only thing the user needs to do is download the token software for their device, iPhone, Android, Windows Phone, BlackBerry, etc. Protect sensitive data and mission-critical systems with the industry’s highest-quality hardware tokens. 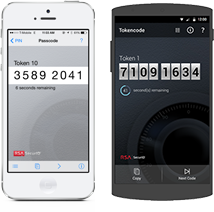 RSA SecurID® hardware tokens consistently and reliably generate access codes and are known for their durability and long battery life.